From time to time, I like to read books about hearing loss. It is important to stay up to date on current information and trends, and also interesting to see others’ perspectives on hearing loss or tinnitus. When I find a good one, I hope to share it with my readers. 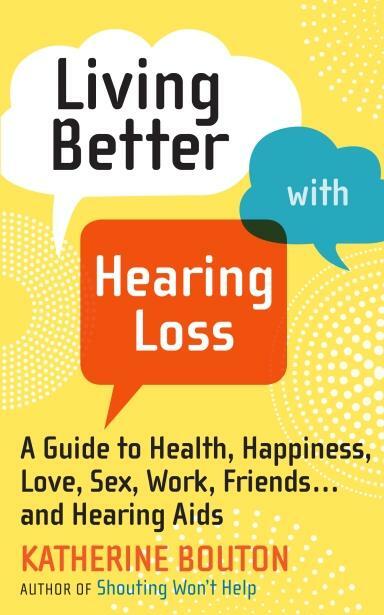 Katherine Bouton’s Living Better With Hearing Loss is one such book. It is a treasure trove of detailed information on the ins and outs of hearing aids, hearing loops, cochlear implants, tips for traveling with hearing loss, tips for coping with hearing loss on the job, and even with dating. There is also an extensive glossary and resource guide at the end for people interested in learning more. It is a great reference tool for anyone with hearing loss, whether you are new to it or a seasoned veteran. The book is well researched and quite detailed, which should save time for anyone trying to learn more about the various hearing aid options, assistive listening devices, and the like that are on the market today. This information changes so rapidly, but the book provides a good starting point and Katherine has stated that she hopes to keep it updated in its e-book format. Katherine also makes good use of her contacts from the Hearing Loss Association of America (HLAA) Board, where she is secretary, sharing insights and knowledge from several fellow board members and others related to HLAA. Katherine provides a balanced perspective on controversial issues like whether to use a hearing aid or a personal sound amplification product (PSAP), or how to handle your hearing loss in a job interview, but comes down loudly and clearly in support of hearing loops, Medicare coverage of hearing aids, and the need for lower cost hearing aids for the millions of people who need them, but cannot afford them. Her tips on traveling with a hearing loss were some of my favorites, including her emphasis on preparation. I agree, as detailed in my post How Many Gates Changes Does It Take to Trip Up A Traveler With Hearing Loss? The section on dating is perhaps the most amusing part of the book. Who knew that some crazies actually target the hard of hearing or deaf when looking for a mate in hopes they will find a more docile companion? They obviously have not met me! And hearing aid fetishes? Seriously? Most importantly, the book has a positive tone stating that you CAN live well with hearing loss if you take the necessary steps to accept and treat it, and she encourages her readers to do so. By sharing her own struggles with hearing loss, Katherine points out the pitfalls of denial and the impact it had on both her career and personal life. I could relate to her journey as detailed in my post Coming Out Of My Hearing Loss Closet, which discusses my personal path to acceptance and treatment. If you have the opportunity, check out this thoroughly researched and highly informative reference tool. Readers, do you like to read books about hearing loss? Wow, I can’t wait to buy that book. My mother is dealing with hearing loss from the past two years. It was very difficult for all of us. She would get angry at every silly thing. And stayed home most of the time. Her audiologist at Hearing solutions, gave her a hearing aid and things got a little better. However her confidence level has gone down, since the hearing loss. I will get her this book. Thanks for sharing! Great! I hope you find it helpful. Good luck to you both!